Doug Harris (Josh Gad) is marrying Gretchen Palmer (Kaley Cuoco-Sweeting) in two weeks. The problem is, Doug has no friends. This means no best man and no groomsmen. Of course, he has been lying to Gretchen, saying that he just wasn’t able to get a hold of them, never letting on that he had no one lined up. Doug turns to Jimmy Callahan (Kevin Hart) for help. Jimmy runs The Best Man, Inc., where he rents himself out to people like Doug who have no one to stand up for them at their weddings. Doug is willing to pay any cost to have Jimmy perform the “Golden Tux,” consisting of a best man and 7 groomsmen. It is a legendary feat that has never been pulled off before. Jimmy takes on the challenge and helps groom Doug for his wedding. Jimmy’s selection of groomsmen include a motley crew of guys he knows. With only two weeks to prepare for such a massive undertaking, the crew gets to work. The end of the year is typically full of heavy, somber films, leading up to awards season. This means a lot of serious, thinking films. January is a good time for pure escapism films. Like The Wedding Ringer. The movie is far from original. It is almost a mashup of Hitch and I Love You, Man. A loser with no friends to serve as best man, looks to a suave professional to help him. And, much like Hitch, it even features a dance montage scene. Although, the dance scene between Josh Gad and Kevin Hart is a little less “make fun of the inept white guy” than Will Smith and Kevin James. I like both Kevin Hart and Josh Gad. They have great chemistry in this film. Pairing them together makes for a funny film.Add in the group of “groomsmen,” including Jorge Garcia, Alan Ritchson, Affion Crockett, and Dan Gill and you have a cast that works well together. Sight gags from Cloris Leachman and Josh Peck, brief as they are, and appearances by Ignacio Serricchio, Jeffrey Ross, and Ken Howard help round out the film. 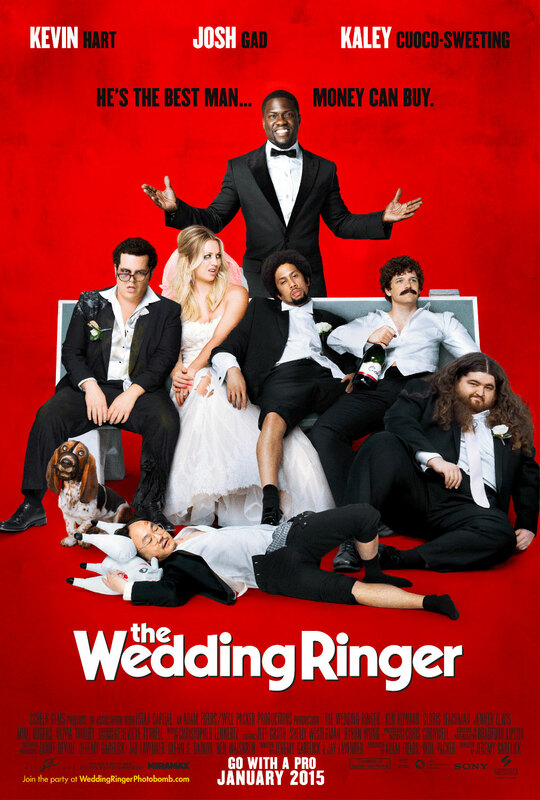 I was pleasantly surprised by The Wedding Ringer. I wasn’t expecting much, but it was much funnier than I thought it would be. Sure, some of the jokes are easy targets, maybe even recycled. And some are definitely over the top. But it’s a refreshing break from the films I have been watching lately, regardless of how good they are. It’s not a film you need to think about. You can just sit back, relax, and enjoy the humor. If you’re itching to get to a theater, The Wedding Ringer will give you a good laugh.